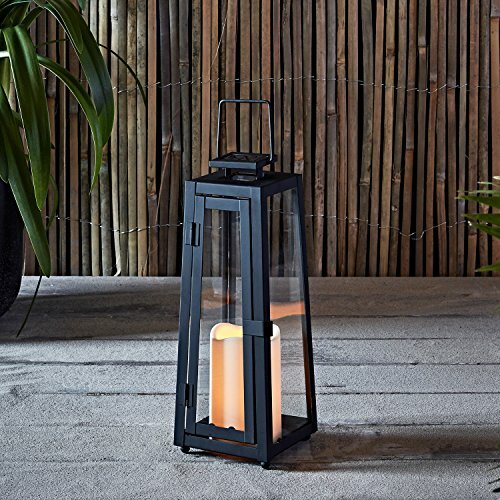 With its classic clean lines and elegant, geometric design, our timeless black solar lantern makes a chic addition to any patio or yard without the mess of real wax or a hazardous naked flame. This lantern also makes a beautiful table decoration for alfresco dinners and its sleek handle makes it even easier to transport or store. Thanks to the nifty built-in solar panel, you can expect up to 8 hours of illumination every evening in Spring and Summer. Simply let the panel charge during the day and you'll be greeted by a beautiful flickering amber glow from the LED candle nested within the lantern come nightfall. Candle Dimensions: H5" x D3"
If you have any questions about this product by Lights4fun, Inc., contact us by completing and submitting the form below. If you are looking for a specif part number, please include it with your message.